The first new candy bar to carry the Hershey's name in more than two decades is set to hit shelves next month. PHILADELPHIA -- The first new candy bar to carry the Hershey's name in more than two decades is set to hit shelves next month. The Hershey, Pennsylvania-based candy maker says Hershey's Gold will go on sale Dec. 1. It's described as a caramelized cream bar embedded with salty peanut and pretzel bits. Hershey's says the bar is a response to trends that it says show "the rising popularity of crunchy multi-textured candy." 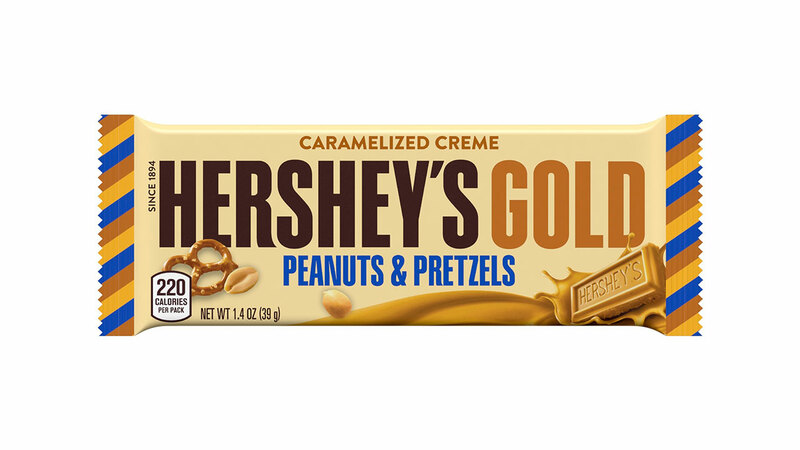 Hershey's Gold will be the fourth bar for the brand and the first new one since Hershey's Cookies 'n Creme was introduced in 1995. The original Hershey's bar was released in 1900 and was followed up by the special dark variety in 1939.